After a few false starts, fall has finally settled here in north Texas—and nowhere is this more evident than the bowls of produce on my kitchen counter. My tableau of stoplight tomatoes and blushing peaches has given way to the jeweled tones and dappled textures of autumn: leathery potatoes, emerald apples, freckled pears, garnet grapes. Standing in my kitchen, surveying my farmers market bounty, I understand why artists have been known to break out their oil paints in the presence of such exquisite, accessible beauty. I’m lucky to live in a region with such a long growing season; lettuces and other leafy greens that bolted back in June are finally making a comeback, joined by an abundance of root vegetables and winter squash. As the days grow shorter I also find myself darkening the door of my pantry more frequently, calling on canned beans or dried cranberries to step in for summer’s sweet corn and stone fruits. This salad tosses the best of market and pantry together in one (preferably chilled) bowl. Serve it alongside a puréed soup (if you like butternut squash, I not-so-humbly suggest you try this one) or add a cooked chicken breast for an easy workday lunch. It’s what I’m packing tomorrow, in fact, as I begin a new chapter of my career. After six years as a news producer (and a brief but rewarding stint as a nanny) I’m joining the marketing department in one of Dallas-Fort Worth’s rapidly-expanding suburbs. I’m not sure if I’m more thrilled about the work (when hired, my new boss joked “I hope you like to write!”) or the predictable, no-weekends-or-holidays schedule (it’s been several years since I’ve eaten Thanksgiving dinner on Thanksgiving). Girl and Apron will continue—and, with any luck, keep growing—but I want to take a moment to say thanks to all those who liked, shared, commented, or complimented my efforts over the last five months. Whether you knew me in high school or found me through FoodGawker, your feedback motivated me to keep setting up my tripod and returning to the keyboard. During this season of gratitude, I have much to be thankful for. Rinse greens and dry them thoroughly. Tear leaves into bite-sized pieces and divide evenly between two large, chilled salad bowls. Dice the apples and cut the grapes in half. 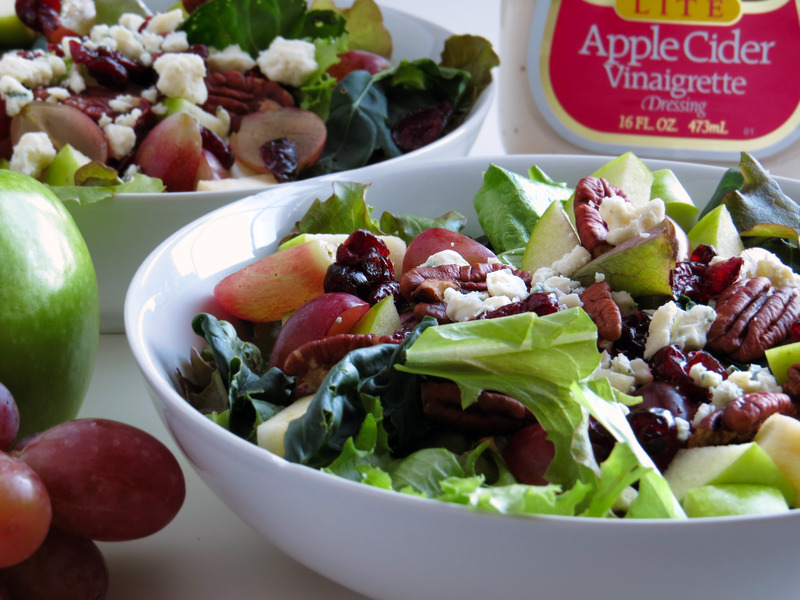 Scatter fruits, pecan halves, cheese, cranberries, and cooked chicken strips on top of the prepared salad greens. 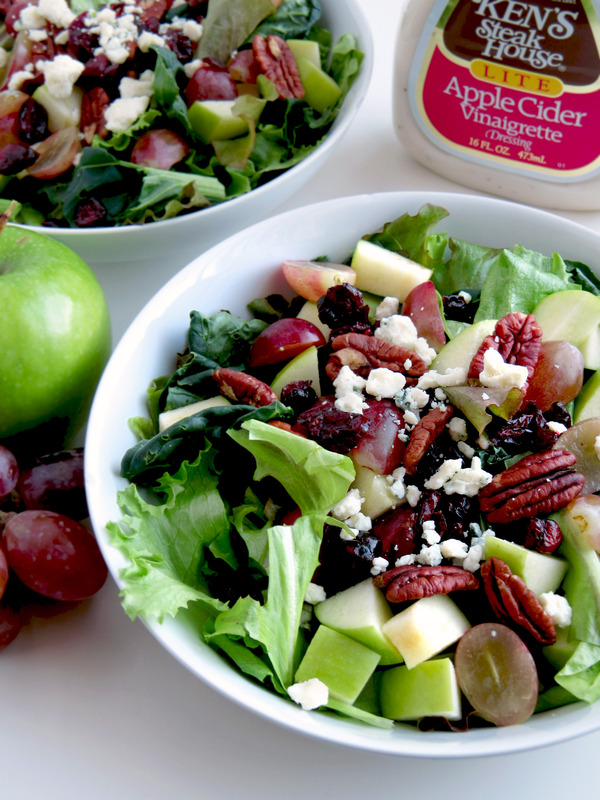 Drizzle with vinaigrette. Serve cold. Looks delicious! Congrats on the new adventure. Proud of you, and yes keep writing – your writing is refreshing and your recipes make me drool 🙂 Glad you are well!